it is altogether impossible to live at all without forgetting. Rub the white ash from your eyes and dwell with me on the cover of Art Spiegelman’s In the Shadow of No Towers, his own graphic narrative detailing his lived experience of 9/11 and its ensuing aftermath on his psyche. I make mention not only of the cover that serves as a prelude to the remembrance that follows in his work, but the one that came before it – a similar “black-on-black afterimage of the towers” published in The New Yorker six days after 9/11. Removing the very materiality of the twin towers from his illustration, Spiegelman pulls the plug on their physical destruction as mediated to us through around-the-clock, play-by-play news streams and footage snapped on that day, the kind that catapulted even bystanders into the cult of amateur photojournalists. Instead of the countless images burned into our collective retina and which still serve as visual metonyms for 9/11, only the towers’ faceless silhouettes, the shadows of their former selves, come forward from the darkened background, and haunt the terra firma of our own reality as a literal physical wound now marring the horizon of lower Manhattan. Similar to Jacques Derrida’s conception of the “specter” who “is the future, is always to come, presents itself only as that which could come or come back,” the razed towers demand to be reckoned with, no matter how much we may fight against their apocalyptic return. It is perhaps because their return in memoriam, as a kind of ghostly memory that can never be fully fleshed out in narrative form, has already happened that escape from these phantom towers is near impossible. The word will always miss its mark. 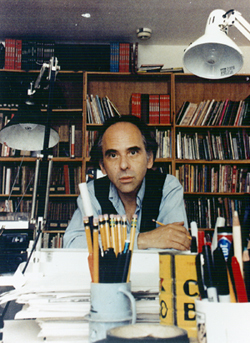 Spiegelman’s work then creates a system of relationality among traumatic historical moments that have tickled the specter of Apocalypse out of hiding, also revealing in the process how such end-of-the-world narratives are often engineered by hegemonic power structures which demand that certain national collectives react and behave in conforming, non-threatening ways. In short, he calls attention to how the American government itself has looked through this atemporal specter in justifying its own preemptive acts of violence against Afghanistan and Iraq, following 9/11. Or: could we entertain even another possibility in reading this “black-on-black image” of the twin towers with which I began? Could Spiegelman have intended for these towers, like two funeral pyres on which the flames have already been snuffed out, to recede into the background, pulled by some force beyond our visible recognition? Does he suggest that 9/11, like the Holocaust, the atomic bombing of Hiroshima, and other cultural traumas, are bound to inevitably be sucked up into some historical blackhole where its memory, as it haunts the future from the past, will create no viable space in which such “apocalyptic” moments cease to exist? What Spiegelman seems to believe is that even in the physical absence of the twin towers, the presence of its weight in history (as well as its ties to other apparent traumatic moments) cannot be ignored or deflected elsewhere; we exist in the shadow of what is no longer with us, and much like those who immediately vaporized in the heat of the atom bomb, leaving only behind their literal “shadows” imprinted against some material background, the spectral presence of these towers’ material absence may privilege the need to linger over the apparent void above the desire to fill that void. The specter itself is the site of the sublime, the beautifully horrific, an excess of the Real that can never be fully integrated in the existing symbolic order. Spiegelman demands that we stare straight into this deceptive abyss, and find what gives shape to an event that has already happened and is always happening without our awareness until that knowledge is somehow violently awakened from its slumber. As Spiegelman writes, “[O]utrunning the toxic cloud that had moments before been the north tower of the World Trade Center left me reeling on that faultline where World History and Personal History collide,” he exposes what was there all along. It was not that the “faultline” between World History and Personal History suddenly emerged after the north tower of the WTC collapsed, but that the collapse itself unveiled the ever-presence of such a Janus-faced locus. Like Walter Benjamin’s “angel of history” at whose feet, the past collects as a “single catastrophe,” Spiegelman is literally blast from the site of trauma and lands between World History and Personal History, recognizing that in his own horrific experience of 9/11, he felt the echoes of a larger history of violence that never fully escaped us; in fact, it exists with us today and is used to always define the circumstances we inhabit. We can imagine Spiegelman, in the middle, holding back the forces of both World History and Personal History on each side, so that World History does not ultimately conquer and swallow him up entirely, thus erasing his life, memories, and culminating outrage at the American system’s failure to protect the people from its own self-interests. Against a background of faces contorted in fear, with their eyes bulging out of their heads, Spiegelman writes, “I still believe the world is ending, but I concede that it seems to be ending more slowly than I once thought […] so I figured I’d make a book.” Making this book for him then began first as a measure of self-preservation, an attempt to prolong his Personal History and perhaps keep at bay, World History and the destructive apocalyptic features it possesses always. In one frame, Spiegelman dreams at his drawing desk of old funnies on their yellowed pages, yet he must awake and ready to pounce on him and exploit his personal memory of 9/11 and the losses that it signified, are President Bush with revolver and American flag in tow and Osama Bin Laden toting a blood-stained sword, iconic of the primitive qualities that the U.S. government attributed to Them in declaring war. While In the Shadow of No Towers can be defined as a project of personal remembrance, as Spiegelman’s own attempt to reach into the throes of oblivion and render what filled that “shadow” before its permanence became realized in his memory, it also serves as a powerful reclamation of his Personal History from the World History that the state attempts to command, massaging exaggerated fear and paranoia of a future terrorist attack into the minds of a vulnerable public. So while Spiegelman has crafted a space within comics to process the fragments of his own trauma and in its telling, to overcome it, he also “addresses us in an attempt to tell us of a reality or truth that is not otherwise available,” Cathy Caruth states. As his own “angel of history” who organizes under his helm, the supposedly dead and buried past as it unexpectedly reemerges and is resignified by our present circumstances, Spiegelman blasts the so-called mythology by which the American government initially deceived its people. Through the repeated cries of his psychic “wound” caused by 9/11 as well as his visualized confrontation with the institutional forces working to silence that voice, Spiegelman exposes the moment of collision between Personal History and World History, where he finds himself and attempts to put his fingers on its pulse. He inhabits this interface between the two histories, similar to how he falls within the interface between his lived experience of 9/11’s reality and the imagined spaces of the comic medium. Both sides, through their implication in the other, allows this interface, or moment of collision, to not so much result in a violent rupture but produce a dynamic site of historical exchange and transmission that transcends both temporal and spatial boundaries. It is as Caruth writes, “history, like trauma, is never simply one’s own[; it] is precisely the way we’re implicated in each other’s trauma.” In this sense, the traumatic history of 9/11 is never simply its “own.” Instead, it undeniably reaches back to those of the Holocaust, Hiroshima and the others that through his silence, Spiegelman himself participates in their forgetting. “Time [seemed to] stand still” for Spiegelman, as his Personal History before 9/11 came to an apocalyptic end, only to begin anew, but he cannot help but employ the past in trying to impose an order of comprehension upon an otherwise insensible present. Though divided into two parts – one being Spiegelman’s own story about 9/11 and his politically charged reactions to the Bush administration’s exploitation of the “attack” and the other being a collection of old comics such as Hogan’s Alley and Little Nemo in Slumberland which he relishes for its ripeness of any “end-of-the-world moment” – In the Shadow of No Towers reads as a pastiche of multiple narratives assuming the comic strip form. Ten disparate “plates” taking up two pages read upright in newspaper style; each of them is titled “In the Shadow of No Towers,” acquiring the kind of traumatic repetition that reveals traces of the original trauma in the person’s mind as well as its failure to be completely integrated into the existing psychic order. Yet this repetition also serves to defy temporal boundaries in allowing the past to leak in the present, and potentially change our understanding of both, that perhaps past and present are more alike than they are disparate. It seems through this repetition, no one plate prevails over another. Instead they engage with each other on a level playing field, where each tells a different story, toying with our idea of progression always moving in some linear fashion towards a telos. All the while, Spiegelman works within the comic medium expected to move in this chronological, unidirectional manner from one box to the next. The actions and according dialogue should be a progression from the previous material, but from within, Spiegelman explodes this idea of progression predicated on linear time. Instead, he – as a character fleshed out in illustrated form – inhabits all ten plates, either as his spectacled, shaggy-haired self or characterized as a dysmorphic mouse, pulled straight out of Maus, his earlier work that confronts the past of the Holocaust. That Spiegelman is self-admittedly “chipping away at the last [disaster]” underscores the intention behind his project, that despite there being nothing physically left from 9/11, hence the actual towers into which the hijacked airplanes flew, the remaining “shadow” itself must be somehow “chipped away” to reach a truth that has been elided or masked by both human defenses in approaching traumatic memory and by, of course, the “creature in the White House.” Progression as a march towards the future, a movement that proceeds left to right in the comic strip form, is emptied of its traditional importance. In one scene, Spiegelman depicts himself in third-person, falling from the towers in slow motion: “He keeps falling through the holes in his head, though he no longer knows which holes were made by Arab terrorists way back in 2001, and which ones were always there.” Always, seems to be the key word here, as Spiegelman resists the notion that 9/11 is anything new in our history. I wrestle with the belief that he would simply lump 9/11 into a collective category of national and cultural traumas, as doing so would empty it out of its unique meaning and thus participate in what he accuses the Bush administration of, but Spiegelman’s “falling” is far from physical. Instead, his falling can be read as the potential traveling through a wormhole between two points existing on the same vertical plane – between his present distress over his experience of 9/11 and the knowledge of other explosive moments in both American and global history, usually diminishing mass human annihilation on an inconceivable scale, to mere representation, the cause of beginning or ending wars, and nothing more. Yet he is not alone, left to float through the endless space of history like the tumbling, lost boot of an anonymous astronaut. Blast into a “post-9/11 future” with his eyes mesmerized by the catastrophic elements of “past” history that pile at his feet, Spiegelman is caught in the arms of the eternal specter, from whom he finally realizes he can never seek solace as it poses the possibility of apocalypse always. Instead, he, as Derrida proffers as the best solution, attempts to reconcile with the specter, “learn[ing] to live by learning…how to talk with [the ghost], how to let [it] speak or to give [it] back speech, even if it is in oneself, in the other, in the other in oneself.” That is, Spiegelman enables the specter to be solace itself, finding within the space of collision between Personal History and World History, between his reality and the imagined one of comics, a way to run his pen through the invisible materiality of the specter and impose upon it, a visibility that functions as a testament not only to his own traumatic experience of 9/11 but his coming-to-terms with a World History perpetually haunted by the “shadow” of inconceivable physical and human destruction.